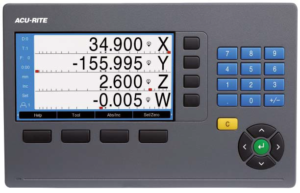 If you are looking for Acu-Rite DRO 203 digital readouts (one, two or three axes) for sale or replacement parts then you are welcome to contact us at (972) 822-0478 or contact us with your questions. It is programmable for 3 or 4 axes. The ACU-RITE DRO 300 is a versatile digital readout designed primarily for milling, drilling, boring, and lathe machines with up to four axes. A separate I/O unit provides switching input/outputs for simple tasks in automation. Thanks to its splash-proof full-travel keyboard, the DRO 300 is exceptionally well-suited for use in a workshop. It supports all operations with intuitive interactive menus on its large, easy-to-read color flat-panel display. The DRO 300 has the same functions as the DRO 203. In addition, the DRO 300 offers a connection for the KT 130 edge finder. This allows you to define presets and datums with speed and precision. The DRO 300 digital readout supports you with special probing functions. In addition, the DRO 300 is programmable, which makes it ideal for small-batch production on conventional machine tools. The DRO 300 allows you to store up to eight programs, each with up to 250 working steps. Programs are created by either keying them in step by step or by generating them using actual position capture (teach-in programming). A USB port enables the writing and reading out of data and files. The most complete digital readout system in the machine tool marketplace, the DRO300 has full part program capability, 99 tool offsets and multiple DRO displays along with standard input/output capability and edgefinder probe support all on an easy to read 7-inch color display. Designed and manufactured in the USA, ACU-RITE readouts are the first choice of machine tool builders and users alike. The currently moving axis can be geographically highlighted. In “dynamic zoom” mode, the position value is zoomed to its maximum size depending on the number of digits. This greatly improves legibility—especially from a great distance. When you switch on the digital readout for the first time, the DRO300 supports you with an installation guide. You are led step by step through the most important settings until the device is ready for operation. Depending on the ambient-light conditions at the machine, you can switch the screen of the DRO300 to a light or dark background.